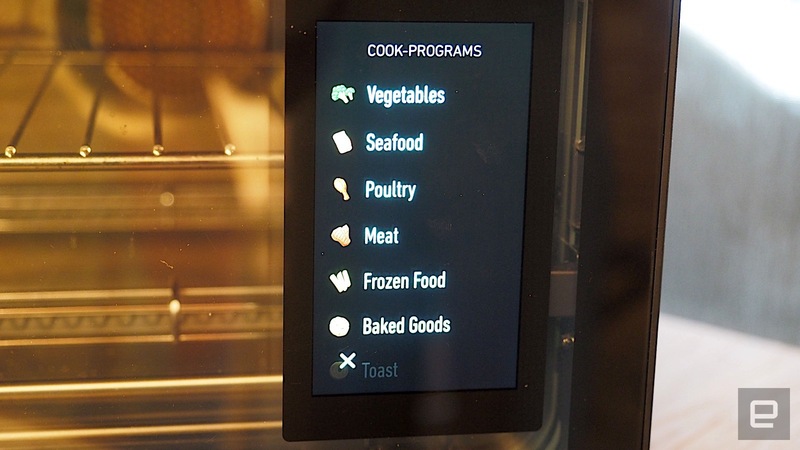 Two years ago, June unveiled its first smart oven, complete with a 2.3-GHz quad-core NVIDIA processor, lots of sensors and a dose of artificial intelligence. In my review, I was mesmerized by how well it cooked a variety of foods simply using preset programs. Unfortunately, at $1,500, it was ridiculously expensive. Today, June is discontinuing it and is ready to reveal its second-generation oven. 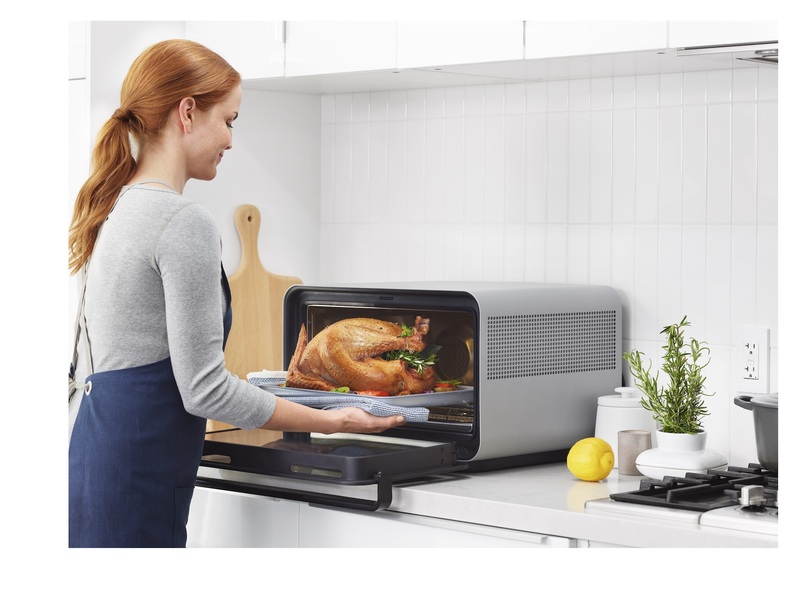 Not only does it cook faster, it's smarter and, at $600, significantly cheaper. Hardware-wise, the new June is similar to the old one, with a couple of exceptions. It no longer has a stainless-steel knob, which was largely extraneous anyway because there's a 5-inch touchscreen. June also got rid of the weight scale, which required the addition of load cells to each foot of the oven. June CEO Matt Van Horn told me that in the company's research, most customers weren't using the scale, so removing it was an easy decision. Plus, going without the knob and the scale helped to drop the price of the oven significantly. The size of the June hasn't changed. At 22 inches wide, 13 inches tall and 18 inches deep, It still has a pretty large footprint -- large enough to present a problem for those with limited counter space. Its 1-cubic-foot capacity does make up for it, though: June says it's big enough to fit a 12-pound turkey. The same carbon-fiber elements for faster heating are here, along with the same NVIDIA Tegra K1 processor. There's no upgrade to HD camera mounted on the oven's ceiling, either, which is used to identify the food you're cooking (you can also use it to keep tabs on what's going on). The stainless-steel interior has been updated to be easier to clean. Van Horn says a lot of the magic of the June comes from software. As shown with the addition of functions like the slow cooker, air fryer and dehydrator. 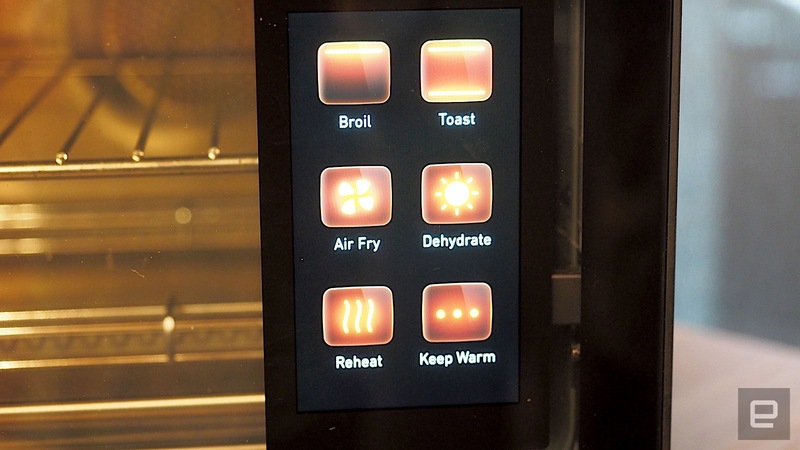 "We've literally been able to build new appliances in software," he told Engadget. June has also ramped up the number of preset cooking programs. In 2016, there were 25 presets; now there are over a 100 covering a wider variety of foods. June used (opt-in) user feedback to inform which foods to add. "We were able to see the most popular things people were cooking in the June, and then we created cook programs for that," said Van Horn. For example, a lot of customers like using their oven for reheating pizza. So now, the June has a cook program for "leftover pizza." Like the original June, the new oven has a companion app (available on both Android and iOS). Via the app, you can check in on the food, set reminders and timers or view the aforementioned recipe library (if you subscribe). The June also works with Alexa-powered devices. So if you have an Echo, for example, you can say things like "Alexa, ask June how much longer?" and it'll tell you roughly how much longer it'll take for your meal to be done. Smart ovens are still a novelty. Tovala comes the closest to June, but it requires a meal-delivery service to really take advantage of it. It also lacks the same plethora of cooking presets you'll find with the June. 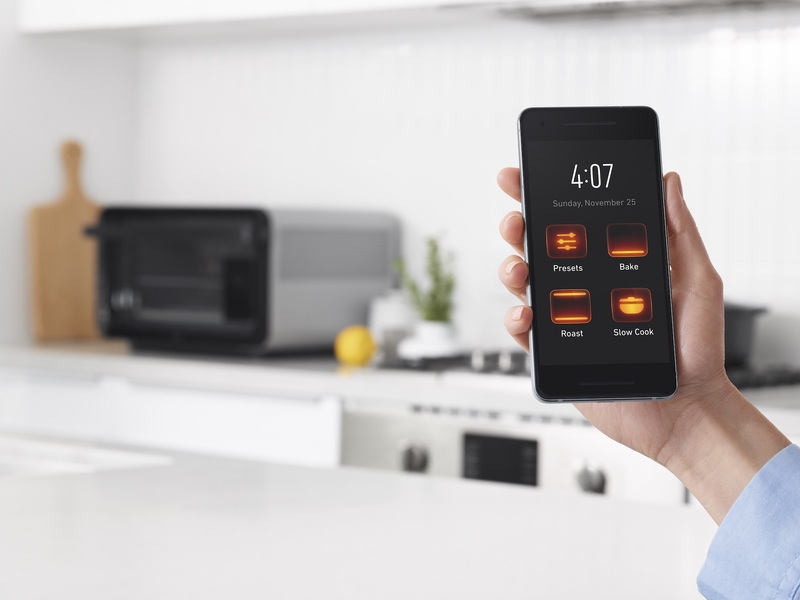 There's also Innit, a system that can scan the food in your fridge, suggest recipes and then preheat the oven for you, but it isn't in a lot of appliances just yet. GE, Samsung and Whirlpool, among others, have also invested heavily in the connected-kitchen space, but none of them have the same level of cooking smarts as the June (yet), and, well, replacing an oven range is often a whole lot more expensive and cumbersome than just getting a countertop oven. Van Horn gave a brief demonstration of the new oven to me last week. He put a petit filet in the June, and the camera immediately recognized it as a piece of meat. The oven then displayed its two best guesses of which meat it was on the touchscreen; one was a steak, the other a lamb chop. "Even if we're 99 percent sure it's a steak, we want you to confirm it's a steak. That data is important to us," he said. He then selected the steak, inserted the probe thermometer according to a visual guide, opted for "medium rare" and hit start. The oven then gave a rough estimate of when the food would be done -- in our case, around 15 minutes. There was no need to preheat the oven, as that time was folded into the ETA. The time then adjusts as it gathers more data from the cook session. After just under 12 minutes or so of switching from roast to bake to broil, the steak was done. And it was, indeed, medium rare. The preset cook programs have also improved through customer feedback. Just after launch, a lot of customers and reviewers complained about bacon. "We had a one-size-fits-all bacon program," said Van Horn, which, unfortunately, resulted in it being either burnt or undercooked. After gathering sensor data and video logs from June customers who'd agreed to share their information, June learned that an important variable with bacon is the number of slices. "One slice of bacon versus seven slices of bacon required a completely different cook program," he said. It also differs depending on whether you prefer it chewy or crispy and whether you're using foil or not. "We learned that one cook program for bacon wasn't enough. Now we have 64." Of course, you won't see this list of 64 presets when you put your bacon in the oven. Instead, it uses some artificial intelligence and your personal preference to automatically fill in fields. June has a long roadmap of features ahead. "I probably shouldn't say this, but one of the features we're working on right now is a rice cooker," said Van Horn. "We want to replace more and more appliances on the countertop," he continued. "We want this to be an all-in-one cooking appliance." 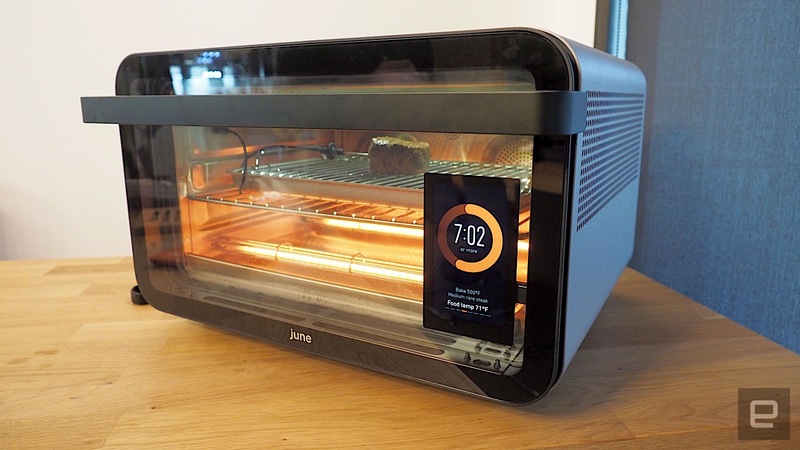 June is offering a "gourmet" package of its second-generation oven. For $200 more, you'll get a two-year warranty, a three-year cookbook subscription plus a set of three air-fryer baskets. That means the "gourmet" package will cost a total of $800. While the original price of $1,500 felt like way too much for a kitchen appliance, the new price of $600 is much more palatable. The closest comparable high-end toaster oven is Breville's Smart Oven Air, which costs $400 but is not really that "smart" despite its name. It doesn't come with more than 100 cooking presets, it can't be updated over time and it doesn't come with a companion app. Yes, $600 is expensive, and yes, the June takes up a lot of counter space. But for those who can spare the cash and the real estate, the new, lower price combined with the continued new features makes it a whole lot more compelling.